Steep bluffs and cliffs border the edge of the picnic grounds. Please use caution. Be careful crossing the road. As of September 27, 2017, the Heritage Hall at Peace Arch Provincial Park will offer reservations for the 2018 season up to 1 year in advance of your arrival date, via our Discover Camping Reservation Service. Peace Arch Provincial Park is unique in BC’s system of provincial parks. Its location straddles the 49th parallel, with its planning and development done in conjunction with Washington State Parks. With its formality of beautiful lawns and gardens, this park is like no other. 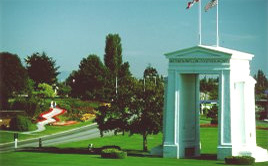 The Peace Arch, dedicated in 1921, was the first such structure in the world. It was built on the International Boundary between Canada and the United States to commemorate the lasting peace between the two countries. School children from the United States and Canada donated money for the purchase of the land surrounding the Peace Arch and in 1939 the Canadian portion of the Peace Arch Park was officially dedicated. The park provides opportunities for walking and indoor/outdoor picnicking. Please note: The parking lot is situated on Semiahmoo First Nation Indian Reserve land. As the land is located outside the park, BC Parks is not responsible for vehicles or occupants in the parking lot. Please be advised that as this park is on the Canada/US Border you may be asked to provide identification and immigration information by officers of the Canada Border Services Agency and/or the US Customs and Border Protection. There are no vehicle accessible camping facilities at this park. Heritage Hall is available for day-use reservations by the public through Discover Camping. The park is about 40 km south of Vancouver and is situated on the International Boundary at the Douglas Border crossing. This is at the junction of Highway 99 in British Columbia and Interstate 5 in Washington State. History: The Peace Arch is the world’s first monument to peace. Sam Hill a prominent American businessman, conceived the idea of the Arch. Mr. Hill laid a hollow cornerstone within which he placed a hammered steel box made from the steel of a captured slave ship. Inside the box, he placed a piece of the Beaver and the Mayflower. The Arch was fitted with two iron gates, leaving them open to symbolize peace between the two great nations. Peace Arch was dedicated in 1921. The lands around the Arch were gathered through donations and fundraising efforts. Two decades later, on November 7, 1939, the Peace Arch and surrounding lands on the Canadian side became Peace Arch Provincial Park. Conservation: The park features the historical Peace Arch with its engravings “Children of a Common Mother,” on the Washington side and “Brethren Dwelling Together in Unity,” on the British Columbia side. Among other things, the park offers broad lawns, public areas, a lily pond and a flower garden in the shape of the Canadian flag. Flowers, trees and shrubs are part of the park’s natural heritage. Please do not damage or remove them. This park has a day-use/picnic area and there are 37 picnic tables available. There is also a large adjacent grassy area. Wheelchair accessible flush toilets are available. There is no locked gate. Heritage Hall is available for day-use reservations between April 1 and October 31, annually. Reservations can be made through Discover Camping. The hall contains a kitchen and has an occupancy of 150 people. The reservation fee includes the use of tables and chairs. There are flush toilets available at the park. There is a wheelchair path from the parking lot to the washrooms. The trail is approximately 300 metres long.